San Francisco's new transportation hub has closed less than two months after opening, following the discovery of a major crack in one of its steel beams. The Salesforce Transit Center, designed by Pelli Clarke Pelli Architects, shut its doors to the public on Tuesday 25 September 2018 after a worker installing ceiling panels on the third-floor bus deck spotted the crack. According to local news source SFGate, the defective 6.5-foot-deep (two-metre) beam is located on the eastern side of the structure, and one of those supporting the centre's rooftop park. "The beam is cracked, so the behaviour of the beam is unpredictable," said Mark Zabaneh, executive director of the Transbay Joint Powers Authority. "We will be working tonight and tomorrow morning to get a better understanding of the cause of the crack." For safety reasons, commuters were redirected to the nearby Temporary Transbay Terminal, which was used during the centre's construction, and some of the streets surrounding the building were cordoned off. "The safety of everyone who visits the Salesforce Transit Center is our obligation and highest priority," Zabaneh said. "While this appears to be a localised issue and we have no information that suggests it is widespread, it is our duty to confirm this before we allow public access to the facility." The transit centre is located close to the residential Millennium Tower, which has experienced widely reported structural issues. Completed in 2009, the 58-storey building has sunk significantly and tilted 18 inches (46 centimetres), while a large crack appeared in one of its windows earlier this month. However, Zabaneh assured that the issues were unrelated. "We don't see a nexus," he said during a press conference on Tuesday afternoon. 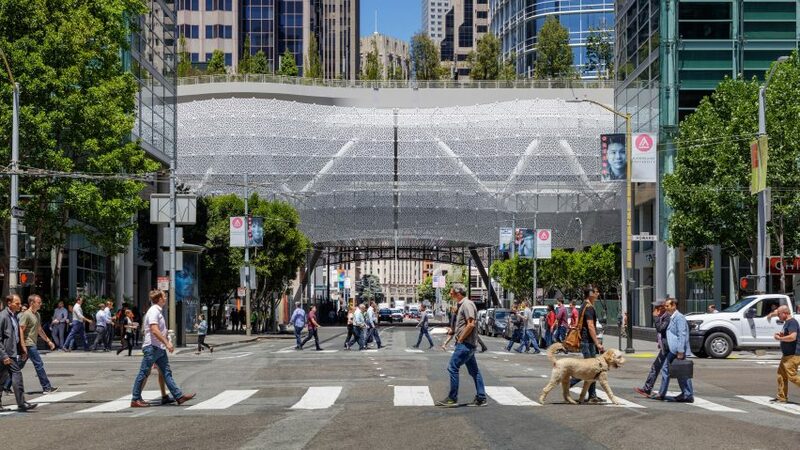 Inspections will now take place on all of the structural beams at the Salesforce Transit Center before it reopens. The $2.2 billion project encompasses 1.5 million square feet (140,000 square metres) over multiple storeys, and is opening in phases with the intention to connect 11 regional, state and national public transport modes. Bus services began operating from the centre on 13 August 2018, and the rooftop park first welcomed visitors two days before. The centre sits adjacent to the Salesforce Tower, which was also designed by Pelli Clarke Pelli and became San Francisco's tallest building when it completed in January 2018.